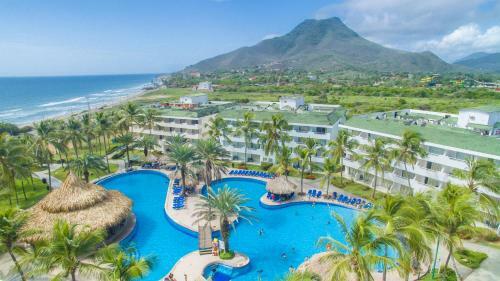 Hotel Sunsol Isla Caribe is ideally located on Carretera Costanera Sector Playa El Tirano, Isla de Margarita, Antolín del Campo, Nueva Esparta, Venezuela in El Agua just in 3.1 km from the centre. That is suitable for a beach/seaside, family weekend. The nearest Santiago Marino is disposed in 27.2 km from the hotel. You can use a huge range of services: 24-hour reception desk, billiards, modern game rooms, special non-smoking rooms, mini-market on site, nightclub/DJ, shuttle bus service(additional charge), massage, well-appointed restaurant. Supported types of bank cards: American Express, Visa, Mastercard, Maestro. For guests, best accommodation are offered 2 rooms in the hotel. Guests can choose from different types of rooms: twin, double. For guests are provided facilities such as safety deposit box, air conditioning, clothes rack, hairdryer, free toiletries, telephone, flat-screen tv.